BERLIN (AP) — John Demjanjuk, a retired U.S. autoworker who was convicted of being a guard at the Nazis' Sobibor death camp despite steadfastly maintaining over three decades of legal battles that he had been mistaken for someone else, died Saturday, his son told The Associated Press. He was 91. 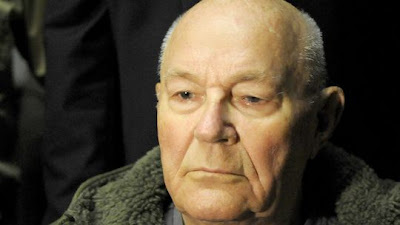 Demjanjuk, convicted in May of 28,060 counts of being an accessory to murder and sentenced to five years in prison, died a free man in a nursing home in the southern Bavarian town of Bad Feilnbach. He had been released pending his appeal. John Demjanjuk Jr. said in a telephone interview from Ohio that his father died of natural causes. Demjanjuk had terminal bone marrow disease, chronic kidney disease and other ailments. It was not yet known whether he would be brought back to the U.S. for burial. Ukrainian-born Demjanjuk (dehm-YAHN'-yook) had steadfastly denied any involvement in the Nazi Holocaust since the first accusations were levied against him more than 30 years ago. "My father fell asleep with the Lord as a victim and survivor of Soviet and German brutality since childhood," Demjanjuk Jr. said. "He loved life, family and humanity. History will show Germany used him as a scapegoat to blame helpless Ukrainian POWs for the deeds of Nazi Germans." His conviction helped set new German legal precedent, being the first time someone was convicted solely on the basis of serving as a camp guard, with no evidence of being involved in a specific killing. Presiding Judge Ralph Alt said the evidence showed Demjanjuk was a piece of the Nazis' "machinery of destruction." "The court is convinced that the defendant ... served as a guard at Sobibor" from March 27, 1943, until mid-September 1943, Alt said in his ruling. Israeli Holocaust scholar Yehuda Bauer, who researches at the Yad Vashem memorial, said Demjanjuk's story showed an important moral lesson. "You don't let people, even if they were only junior staff, get away from responsibility," Bauer said. Despite his conviction, his family never gave up its battle to have his U.S. citizenship reinstated so that he could live out his final days nearby them in the Cleveland area. One of their main arguments was that the defense had never seen a 1985 FBI document, uncovered in early 2011 by The Associated Press, calling into question the authenticity of a Nazi ID card used against him. Demjanjuk maintained that he was a victim of the Nazis himself — first wounded as a Soviet soldier fighting German forces, then captured and held as a prisoner of war under brutal conditions. "I am again and again an innocent victim of the Germans," he told the panel of Munich state court judges during his 18-month trial, in a statement he signed and that was read aloud by his attorney Ulrich Busch. He said after the war he was unable to return to his homeland, and that taking him away from his family in the U.S. to stand trial in Germany was a "continuation of the injustice" done to him. "Germany is responsible for the fact that I have lost for good my whole reason to live, my family, my happiness, any future and hope," he said. His claims of mistaken identity gained credence after he successfully defended himself against accusations initially brought in 1977 by the U.S. Justice Department that he was "Ivan the Terrible" — a notoriously brutal guard at the Treblinka extermination camp. In connection with the allegation, he was extradited to Israel from the U.S. in 1986 to stand trial on charges of war crimes and crimes against humanity, convicted and sentenced to death. But the Israeli Supreme Court in 1993 overturned the verdict on appeal, saying that evidence showed another Ukrainian man was actually "Ivan the Terrible," and ordered him returned to the U.S. The Israeli judges said, however, they still believed Demjanjuk had served the Nazis, probably at the Trawniki SS training camp and Sobibor. But they declined to order a new trial, saying there was a risk of violating the law prohibiting trying someone twice on the same evidence. Demjanjuk returned to his suburban Cleveland home in 1993 and his U.S. citizenship, which had been revoked in 1981, was reinstated in 1998. Demjanjuk remained under investigation in the U.S., where a judge revoked his citizenship again in 2002 based on Justice Department evidence suggesting he concealed his service at Sobibor. Appeals failed, and the nation's chief immigration judge ruled in 2005 that Demjanjuk could be deported to Germany, Poland or Ukraine. Prosecutors in Germany filed charges in 2009, saying Demjanjuk's link to Sobibor and Trawniki was clear, with evidence showing that after he was captured by the Germans he volunteered to serve with the fanatical SS and trained as a camp guard. Though there are no known witnesses who remember Demjanjuk from Sobibor, prosecutors referred to an SS identity card that they said features a photo of a young, round-faced Demjanjuk and that says he worked at the death camp. That and other evidence indicating Demjanjuk had served under the SS convinced the panel of judges in Munich, and led to his conviction. He was ordered tried in Munich because he lived in the area briefly after the war. Demjanjuk, who was removed by U.S. immigration agents from his home in suburban Cleveland and deported in May 2009, questioned the evidence in the German case, saying the identity card was possibly a Soviet postwar forgery. He reiterated his contention that after he was captured in Crimea in 1942, he was held prisoner until joining the Vlasov Army — a force of anti-communist Soviet POWs and others formed to fight with the Germans against the Soviets in the final months of the war. Demjanjuk was born April 3, 1920, in the village of Dubovi Makharintsi in central Ukraine, two years before the country became part of the Soviet Union. He grew up during a time when the country was wracked by famines that killed millions, and a wave of purges instituted by Stalin to eliminate any possible opposition. As a young man Demjanjuk worked as a tractor driver for the area's collective farm. After being called up for the Soviet Red Army, he was wounded in action but sent back to the front after he had recovered, only to be captured during the battle of Kerch Peninsula in May 1942. After the war, Demjanjuk was sent to a displaced persons camp and worked briefly as a driver for the U.S. Army. In 1950, he sought U.S. citizenship, claiming to have been a farmer in Sobibor, Poland, during the war. Demjanjuk later said he lied about his wartime activities to avoid being sent back to Ukraine, then a part of the Soviet Union. Just to have admitted being in the Vlasov Army would also have been enough to have him barred from emigration to the U.S. or many other countries. He came to the U.S. on Feb. 9, 1952, and eventually settled in Seven Hills, a middle-class suburb of Cleveland. He was a mechanic at Ford Motor Co.'s engine plant in the Cleveland suburb of Brook Park and with his wife, Vera, raised three children — son John Jr. and daughters Irene and Lydia.